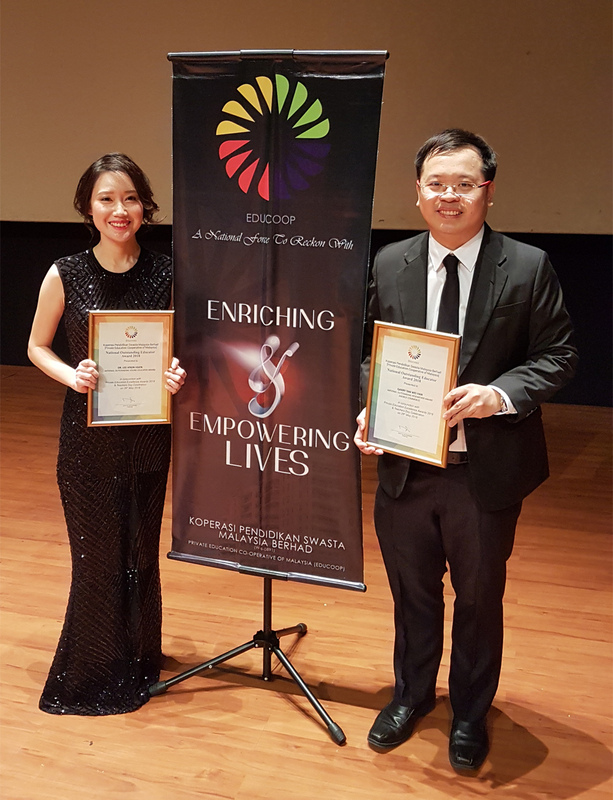 Lecturers from the Faculty of Business and Finance (FBF), namely Garry Tan Wei Han and Dr Lee Voon Hsien were awarded the “National Outstanding Researcher Award (Mobile Commerce) Award” and “National Outstanding Young Educator Award” respectively, at the Private Education Excellence Awards 2018, organised by the Private Education Cooperative of Malaysia (EduCoop) on 26 May 2018 at Dewan Bahasa dan Pustaka, Kuala Lumpur. Among the VIPs present, included Chairman of EduCoop Dato’ R. Rajendran, Deputy President/Deputy Vice Chancellor INTI-UC Laureate International Universities Prof Emeritus Dato’ Dr Ibrahim Ahmad Bajunid, National Icon Educator Award Recipient Tan Sri Dato Seri Dr Yahaya Ibrahim, and along with other 250 representatives from various educational institutions. The “National Outstanding Researcher Award” were judged based on eight pre-determined criteria, which were 1. International Publication, 2. Research Awards, Honours, Recognitions, 3. Research Supervision, 4. Research Grant, 5. External Appointments, 6. Professional Service Contributions, 7. Consultancy Work and 8. Research Impact measured using the H-Index scoring. Tan’s award was based on his research contributions to the field of Mobile Commerce, which many of those researches have received numerous awards and recognitions. “I am delighted and humbled to have received this award which was completely unexpected. Writing an academic paper requires a lot of sacrifices and dedication and as such the award comes as a form of recognition for all the hard work rendered. Additionally the award also serves as recognition to the university in this research field. 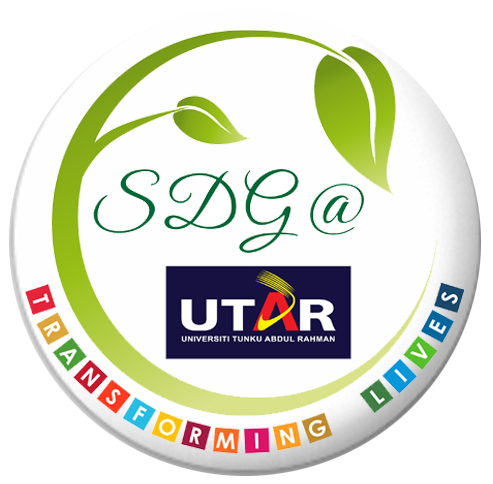 I would like to express my sincere gratitude to Dato R. Rajendran and UTAR for all the supports given,” said Tan. He also advocated for the need to incorporate research into the teaching and learning process, to help facilitate understanding on a particular topic. “Researches done in real life are different from what is told in the textbooks. By conducting research, it helps students to bridge the gap between theory and practice. Additionally, through research I am able to comprehend the complexity of issues surrounding a society. My research on mobile technology adoptions for example helps to make sense on how consumer and society behaves. I am able to explain on the interactions between technology and consumer better which provides preliminary understanding for practitioners when designing their marketing strategies. Thus the findings actually translate into practical contributions for the betterment of the society,” said Tan. When asked of his plan to explore other fields, he mentioned that applicability of consumer behaviour in mobile adoption studies can be extended into many different branches, such as mobile tourism, learning, payment, healthcare, entertainment, shopping, government, transportation, enterprise, social networking and marketing. “Some of the above areas remain largely unnoticed which warrant for more investigation. I am also interested in looking at the integration of mobile technology in the organisation/manufacturing industry. Specifically I would like to understand the determinants of mobile diffusion success among employees,” said Tan. Meanwhile, the “National Outstanding Young Educator Award” is judged based on nine criteria, which are 1. Teaching, 2. Publications, 3. Professionalism, 4. Awards and Recognition, 5. Contribution to the educational community, 6. Professional Contribution, 7. Research Grants, 8. Research Supervision, and 9. External Appointment. “To emerge as the winner for this award is almost like a badge that says you are externally recognised as having achieved something. Studying the award criteria helped me to get a sense of what I want to strive for and identify my skill gaps. It pushes me to become more competitive and increase my visibility. Winning this award also adds to my portfolio of skills and will aid networking and collaboration opportunities in future,” enthused Dr Lee. In her years of teaching experience, she also mentioned that making students interested in a particular subject can be challenging, but as an educator, she said the she tried her best to get students to learn and understand the fundamentals of the subject. “Make the subject achievable by helping them feel they are capable of learning the material. Also, engaged the students by letting them participate in the entire learning process. Above all, understand their interests, so that you will be able to better relate the subject to their lives,” advised Dr Lee. She also emphasised the importance for educators to be good role models that could help students learn, and help them pave a way for a better future. She also shared some of the important characteristics that educators should have, such as fairness, kindness, respectful and punctual. “You can’t teach character, unless you can display it,” said Dr Lee.